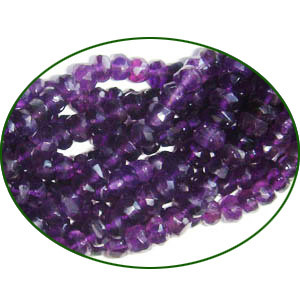 Fine Quality Amethyst Faceted Roundell, size: 4 to 4.5mm semi precious gemstone beads to make fine jewelry, length of string 14 inch. Silver Plated Brushed Beads, size: 10x10x6.5mm, weight: 1.39 grams. Copper Metal Cones, size: 13.5x9mm, weight: 1.11 grams. Leather Cords 1.5mm flat, metallic color - mint green. Silver Plated Metal Chain, size: 2.5x11mm, approx 5.7 meters in a Kg. Flat Suede Leather Cords 4.0mm, Color - Blue. Beaded India is one of the leading supplier, manufacturer and exporter of Rudraksha Beads, Wood Beads Mala, Rosary Beads Mala, Japa Mala, Chanting Mala, Beading Cords, Beading Supplies, Artificial Jewelry and other Beaded Products from India. We lead a wide team of skilled and professional craftsmen and artisans and own accomplishment of meeting all the challenges. We are dedicated to render excellent customer services with 24X7 email support, prompt response, competitive pricing, low minimum order boundary, easy payment options, minimum shipping charges, fast delivery system, regular updates on order processing status, complaint handling and resolving it. We ship our products worldwide using Express Service of leading courier companies like FedEx, TNT, DHL, UPS etc.